← Small Steps Toward the Human Right to Housing in the U.S. This month, decades of economic and social inequity have reached a critical mass with the rise of the Occupy Wall Street movement. Across the country, the self-professed “99 Percent” have organized protests and occupied public parks in opposition of the moneyed interests they believe are decaying America’s middle and lower classes. The protests raise interesting questions about the politics of homelessness and what role homeless people are playing in the Occupy movement. As the Law Center’s human rights legal fellow, and an active participant in Occupy D.C., I’ve thought a great deal about this. 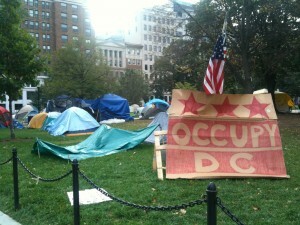 Though it doesn’t make headlines, the Occupy movement directly affects the day-to-day lives of homeless individuals. Prior to the protestors’ occupation of McPherson Square in D.C., a less visible group occupied the park: chronically homeless people. 33 percent prohibit camping in public spaces. 30 percent prohibit sitting and lying in public spaces. 47 percent prohibit loitering in public spaces. In 2007, the City of Los Angeles budgeted $6 million toward policing the Skid Row tent city area and only $5.7 million for homeless services. Twenty-four people were arrested 201 times, with approximately $3.6 million spent on criminal proceedings. For the same cost, the City could have provided housing to 225 people. When the protests in McPherson Square began, there was a danger that they could have the same effect as a criminalization measure: driving homeless people out of the park. I felt a disconnect between the 99 Percent and the homeless people in the park. Given that the Occupy movement is a response to economic inequity, it seemed dishonest to protest without prioritizing the voices of people who are suffering the most. In my day to day conversations, however, I haven’t spoken with any homeless people who feel excluded. In the past few days, I’ve noticed homeless individuals chatting with other protesters while waiting in line for free hot meals. I’ve seen them collaborate and strategize with protesters, and sleep alongside them in the park. For the moment, the Occupy D.C. protests have arguably improved the safety of homeless people in the park by protecting them from discriminatory enforcement of anti-camping laws. Federal regulations forbid camping – including the laying down of bedding for the purpose of sleeping, the storage of personal belongings, and cooking – in McPherson Square. So far, police have declined to enforce these regulations during the protests. At least 40 tents have been erected, taking up one-third of the grass; three meals are cooked on-site each day; personal belongs are piled against a tree; and a generator is running to provide energy for the camp. The City of Portland has announced that the Occupy group may remain in the park indefinitely, but warned the homeless camp that they are in violation of municipal codes that prohibit overnight camping. The City has requested that businesses in the area log code violations by the homeless group, presumably to build a record for future prosecutions. In response, Occupy Portland declared its solidarity with the homeless camp and, on October 20, marched to raise awareness about the treatment of homeless people and collect food donations. Other Occupy groups are taking note. In Seadside, Oregon, Occupiers protested to repeal a law that criminalizes sleeping outside. Occupy Salt Lake City has staged demonstrations protesting police treatment of homeless people. This is a good sign. It’s vital that the 99 Percent commit to challenging structures of oppression that may be easy to overlook. The power dynamics of political movements are real and must be recognized. In any movement, it is easy for group leaders – who frequently have the time, education, and resources that allow them to protest – to control the direction of the movement and overlook individuals who may not have the ability to participate as regularly. These people may choose not to take a public role in the Occupy movement because they do not have the financial resources, or because they cannot risk arrest or deportation. As participants in the Occupy movement, it is important that we remember the people who have been most affected by the One Percent and listen to a diversity voices. If we’re to achieve true economic justice, the Occupiers must acknowledge that the 99 Percent includes homeless people, immigrants, people of color, and low-income individuals – and allow these folks to have prominent roles in the movement. If they do, the movement will continue to grow and may very well bring meaningful change to the U.S. This entry was posted in Civil Rights, Human Rights and tagged homelessness, tent cities. Bookmark the permalink. My trial stemming from the charges is set for April 30th. I’ll update the above link with any developments.